13-Mar-2011 -- What do old friends who get together after 30 years do? Visit a confluence, of course! As I was in the area for the National Science Teachers Association conference, an event that draws at least 10,000 science teachers from around the country, and as our focus at the conference was on geotechnologies, a confluence visit seemed like the perfect capstone. I had the pleasure of seeing old friends for the first time in decades, and our first activity together after meeting for the first time after many decades was depart for the nearest confluence. We traveled south toward the coast, along California state highway 17, which would take us to our goal of 37 North 122 West. Lorrie was an avid geocacher and we all loved geography, so it seemed like the perfect thing to do. We exited Highway 17 at the north end of Santa Cruz to travel for a mile east on Highway 1, exited, and wound through the neighborhood to reach Branciforte Avenue. We then climbed up the hills to Upper Park Road and drove slowly through the beautiful golf course there. It had been years since I had visited here last, and I couldn't remember where I had parked last time. We finally found a place at the disc golf course lot but had overshot our goal considerably. No matter though, it was a pleasant day and we were among friends, so we enjoyed walking back along the road to the location where I knew the jumping off place would be. Despite the fact that this confluence has been visited by more people than any other confluence I have visited, there is always an element of mystery: Would we actually make it there? We dashed across the fairway without mishap and were soon in the trees. After 100 meters, we were very near to the spot, and began the confluence dance. A few hikers passed us. We were standing in a rather precarious position just north of the trail on a slippery slope, and just about ready to call it "good enough" when I thought I would try to zero out the GPS receiver on the lower slope. It took awhile to reach, but once there, I found an old trail no longer used. After 10 minutes, I zeroed out the unit under one of the enormous redwood trees in the area. It is very near to the lower abandoned trail, and despite the low number of satellites visible here, I felt content that I had improved on the earlier visit by zeroing out the unit. I had been to 37 North many times, from California to Virginia, and to 122 West four times, including three in California and once in Washington. This is the last land confluence for 122 West in North America. South of here, along 122 West, one is in the Pacific Ocean, missing all of the islands and not making landfall until Antarctica. The temperature at the confluence was approximately 65 F (18 C) under mostly cloudy skies, on a midafternoon in March, a week before the vernal equinox. We saw no animals, only a few birds, and less than 10 people, although more were on the regular and the disc golf courses. It is good to know that this confluence lies on protected open space and cannot be developed. The trees, flowers, and plants are all magnificent. On the hike back up the slope, I found a backpack with Lorrie standing nearby. We did not investigate it, but on the walk back, Lorrie checked the nearby geocaches on her GPS, and she realized that the backpack must have been the geocache. Perhaps she could return on another day! We took a few more photographs of the beautiful scenery, including a perfectly hollow tree base, before hiking back up the road. The disc golf course was a popular place and the weather was perfect, not too hot or cold. We reached the vehicle after just over an hour round trip. We then traveled to the Santa Cruz harbor, where we saw some damage from the tsunami a few days earliler resulting from the earthquake in Japan. Our spirits were dampened by the news reports from Japan and our hearts went out to the people there. We walked on the beach for a bit and then I needed to go to the airport, so we bade each other farewell, promising that it wouldn't be another 30 years before we would see each other again. Here is to geographic adventures, but more importantly even than those adventures: Dear friends. 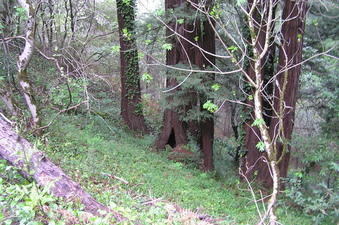 #1: The confluence lies 1 meter to the right of the right-most redwood tree in this photograph. #2: View to the southwest through the fairway to the trail leading to the confluence. #4: View to the east-northeast from the confluence point. #5: Groundcover at the confluence point. #6: GPS reading at the confluence point. #7: Flower just uphill from the confluence. #8: Hollow tree base about 60 meters east of the confluence. #9: Lorrie Conklin, Greg Conklin, and Joseph Kerski at the confluence point. #10: 360-degree panorama movie with sound filmed at the confluence point (MPG format).